Picardy (or Picardie in the French), located just below the northern tip of France is neither the most popular nor the most well known region in France. It shares a climate with southern England and has a small, well looked after coastline. If you stray further up into Calais, however, you will find some of the nicest beaches in northern France - the Opal Coast. The Somme Department attracts the most interest from foreign visitors and is known the world over for its strategic significance in both World Wars. This seems to unfairly overshadow the region's incredibly rich history and architecture going back many centuries. Indeed, Picardy is a treasure-trove of art and natural beauty. From its Gothic cathedrals at Beauvais, Amiens, Senlis, Laon and Noyon, to the chateaux at Pierrefonds, Coucy, Chantilly, Bagatelle and Compiègne, surrounded by magnificent gardens, parks and forests, Picardy offers something for everyone. The flat plains that dominate the landscape here are mostly used to accommodate agriculture. Wheat and sugar beats are most popularly crops. 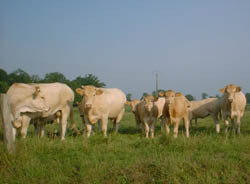 A vast number of dairy and beef cattle are reared here as well. However, the decline of the farming industry has left a number of derelict houses waiting for renovation. The major advantage of buying in this region is the location. The Oise is within easy reach of Paris, and communication links are excellent. There are good road networks giving access to ferry terminals in the north, and rail services to Paris. The Channel Tunnel is close-by and provides a very fast and efficient way of getting to and from the UK. The region has experienced a certain lack of interest from foreign buyers; perhaps having a climate similar to England is not a tremendous pulling factor! Consequently, property prices can be cheaper than you might expect. However, they tend to rise the closer you get to Paris. Do you know Picardy better than we do? Do you have photos of Picardy? Although the Aisne is very close to Paris and the Ile de France the property prices here remain surprisingly reasonable. The region shares many similarities to its neighbour the Champagne Ardenne. The Oise department is close to Paris, while at the same time it provides a scenic and peaceful environment in which to relax. Don't forget to visit Compiegne, France's royal retreat that has somehow managed to escape the tourist trail. The Somme is clearly best known for the battles that took place here during the First and Second World Wars. However, today the Somme is also renowned for its lively restaurants, bars, craft shops and areas of rural beauty. Property prices in the Somme are still quite reasonable. The important town of Abbeville is found in the Somme department of the Picardy region in northern France. Sadly, much of Abbeville's heritage was lost in the bombing raids of the Second World War, although it retains much charm and several impressive sights remain. The city of Amiens is the prefecture, or capital city of the department of the Somme, which is found in Picardy in northern France. Most notable for its superb Gothic cathedral, Amiens is perhaps underrated for its beauty, as it has some charming ancient quarters to discover, and it is surrounded by some very picturesque countryside. The town of Beauvais lies in central northern France, some 43 miles north of Paris. It is a large and attractive town, with a long and interesting history and a thriving modern community. Surrounded by natural beauty, grand chateaux and many other attractions, Beauvais is a great place to visit, or indeed, in which to live. The town of Chambly, in northern France, is an attractive market town with a superb quality of life on offer to its inhabitants. Close enough to Paris for commuting, yet peaceful and pretty, Chambly offers easy access to the capital but retains a traditional, rural feel. Compiègne is a thriving and lively town in northern France. It has come to be regarded as a suburb of Paris in recent times, and is well placed for access to the capital. Despite this proximity to Paris, however, the town is surrounded by some of the most beautiful and well loved forestry in France, the Forest of Compiègne. Crécy en Ponthieu is an attractive and historic market town that is found in the Somme department of the Picardy region in northern France. Situated nearby is the famous Crécy battlefield, and also the beautiful Crécy Forest. Saint Quentin is one of the most vibrant and dynamic commercial cities in the Picardy region. The site of many famous battles, including two very important battles in the First World War, the city has been destroyed and rebuilt at various times throughout its history resulting in a fascinating blend of architectural styles and features. Picardy is in the centre of northern France - just above Paris and the Île de France. WHICH DEPARTMENTS ARE IN Picardy?